Embedded Linux systems (BSPs, u-boot, drivers and new hardware support), Linux applications, network connectivity, software tools, etc. Embedded Linux kernel ports, BSPs, device drivers, etc. I got my start in writing low-level software when I built my first system from parts (not boards) and then modified it with circuits I designed, wire-wrapped, and wrote code for - as a US Navy ET. Along the way, I've used my leadership skills as a team leader and small group manager, and continue to use my home office systems as sandboxes for new operating systems, to implement and test new networking protocols, and to continue to develop embedded software for various processors. What do I do when I'm not writing code? I am an avid fountain pen collector and amateur mechanical watchmaker. My resume may exist on other sites, but this page always has the most recent and up-to-date info. The systems in my lab are networked via 10/100/1000Base-T and/or Wi-Fi 802.11b/g/n, and are connected to the internet via fiber optic (30/15). The web/email/network server - you're reading this on it right now - is a pair of mirrored Centos 7 systems (SELinux) using data on a 6TB RAID-5 NAS and a 2TB RAID-1 NAS. You can see the server stack and RAID systems in one of the pictures of the lab. 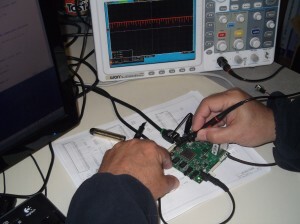 The lab is equipped with networked tools (scanners, printers, WAPs, etc), handheld computers, embedded development boards, and test equipment.